ALEC HOGG: Well, with us now on the line from Canada, is Robin Sharma, ‘The monk who sold his Ferrari’, and the man who wrote ‘The leader who had no title’. Robin, it’s been a transformation of your life over the last little while, but perhaps you can start – kind of – at the beginning. You love telling inspirational stories to the rest of us, but who inspired you to change your life? ROBIN SHARMA: Well, I think my struggle and my unhappiness inspired me to change my life. I think that sometimes when the pain of discomfort gets strong enough, you’re forced to change. Alec, you know I used to be a litigation lawyer. I became a litigation lawyer because everyone around me said that ‘if you did it, you’d be successful. You’d be happy’. I did it. I became a success in the world, but very empty inside, so long story short, I basically started studying happy people, successful people, and people who created epic lives. I started modelling their mindsets. I started installing their routines and behaviours, and I made a big transformation. That gave me the idea and the inspiration to write ‘The monk who sold his Ferrari’. I self-published it in a coffee shop. My mom was my editor and one person at a time, I started telling people about this book, and word about it eventually took over. ALEC HOGG: How long did it take you to write? ROBIN SHARMA: You know, not many people ask me that question. I would say it took me about seven or eight months to write the book, and then just years to get the message out there. If you look at any successful person, they spend years in the wilderness – years of anonymity – and then we see them as successful, and sometimes we think they’re cut from a different cloth or they have lucky breaks. One of the things I want to talk about on July 25th in Johannesburg is success, productivity, and making a difference in the world is much less about lucky breaks and being naturally talented, and much more about strategy, routines, and your deeper beliefs. ALEC HOGG: Last time you were here, my wife and I were right in the front row and we watched the whole session. You put so much into it – so much energy. I think you were on stage probably for about three or even four hours. After that, you must be pretty drained. ROBIN SHARMA: Thank you for that, Alec. I’ve been doing this for almost 20 years and I’m not doing it for the money. I’m not doing it for the applause. I’m doing it because I believe in the importance of each of us being an instrument of service. The reason why I had that energy at the event you were at is because I want to serve, I want to touch people, and I want to remind people that they can be epic in their work. Being a world-class performer in business for example, is much more about seeing your work as a craft, iterating it every day, learning and understanding that mastery is a process, and so on that stage I get the energy from trying to serve, remind people, and inspire them. I think one of the greatest crimes against humanity is getting to the end of your life and having missed spending most of your potential in making your work and the world a better place. ALEC HOGG: So many disciplines that you’ve installed into your own life… Do you still get up at 5:00am in the morning and start doing your exercises and your mediation then to begin the day? ROBIN SHARMA: I do. To be transparent, when I travel I try to get more sleep because it’s so important, but my standard routine is to get up at 4:45am. I get down to the treadmill at 5:00am, I put on some good information, – it might be a good audio book or I might be watching a Ted-talk on my TV. I then work out for 20 minutes or 30 minutes and then I do some journaling of gratitude, planning my day, and then I always do some reading to get me focused because I think that as you know more, you can achieve more. In many ways, the game changer is learning. ALEC HOGG: Do you still read about happy people as you did before ‘The monk who sold his Ferrari’? ROBIN SHARMA: I read so much. Right now, I’m reading a book called ‘Damn Few’. It’s about how Navy Seals are trained and built. I love business books. I read great autobiographies. Yes, I read a lot of books on happiness, but it’s not just inspiration. A lot of it is positive psychology. For example, the book of Sonia Lyubomirsky – ‘The how of happiness’, which really dissects in a scientific way, what happy people do. I still love the wisdom literature, books like ‘Meditations of Marcus Aurelius’. I just love to read and as I said, I call it the 2X3X mindset. If you want to double your influence and your income, make an effort to triple your investment in your personal development and in your professional education. ALEC HOGG: Marcus Aurelius – 2000 years ago – so we can learn from the dead guys. ROBIN SHARMA: We can learn a lot from dead people, you know. What’s the old expression, Alec? ‘If age only could. If youth only knew’. Just imagine if at the beginning of our careers, we learned about leadership without a title, if at the beginning of our careers we learned ‘here are the five things you need to do every day to become the happiest, most energetic person you knew’. Imagine that when we were young, we learned what old people know about being a great human being and crafting a world-class life. That’s why I’m coming back to Johannesburg to share these ideas and to help people, not only to lead without a title and do better work, but so they can become more fulfilled and live lives that are legendary in their own way. I truly believe there are no extra people on the planet. There are a lot of people who wake up every day and are playing the victim, and I think it would be wonderful if they understood that they have the opportunity every day to steadily build a life that matters, make a difference in the world, make a difference in their community, and express more of their potential. ALEC HOGG: I was delighted to see on your blog, that you described Johannesburg as one of your favourite cities. We, who live in Johannesburg, don’t always hear it described in such affectionate terms. ROBIN SHARMA: More than anything else, I love the Jacarandas, I love the food, and I love the culture – I remember one trip I went out to Soweto and it’s still with me today – but it’s the people. I find the people in Johannesburg, as well as in South Africa, such big hearts and so real, and such a fierce devotion to live life fully. Maybe it’s my African roots – having been born in East Africa, I really resonate with the people, but any chance to get back to Johannesburg… I have to tell you, the audiences in Johannesburg are like very few audiences in the world in terms of their hunger to learn, their passion, and their inspiration. ALEC HOGG: And you can make a difference here, Robin. Do you feel that as well? I know many people in South Africa feel they want to be here because it is the kind of country, which is hungry and does need more contributions, and you can make a difference. Do you feel that way, too? ROBIN SHARMA: Yes, I personally feel that I am making a difference. I might speak to an audience – I think at that event you were at last time, there might have been four or five thousand people – but the difference I make is no different than the man who cleans toilets, washes the floor, a taxi driver, or a teacher. I think that every single day, we can go out into the world and in our own unique way, make a difference if we could only understand that. I was at Didimala; a resort, which I believe, is not far from Johannesburg. I talked to a woman at the resort and I said ‘you’re so proud of what you do. Do you like your work?’ This woman was cleaning hotel rooms. Tears literally came to her eyes and she couldn’t talk, and she explained to me that she loves what she does. She walks into the rooms and they’re messy, but because of the pride of her work and her commitment to excellence and making a difference, she leaves the rooms beautiful and perfect. That labour was so important to her. It reminded me that all work has dignity. Every single person can uplift lives and inspire. We do not have to have a title to show leadership and make a difference in the world around us. ALEC HOGG: How do you prepare before these presentations that you give? As I mentioned before, they look so energy sapping…you give so much of your heart and your soul. How do you get yourself ready? ROBIN SHARMA: A number of ways. The night before (I call them game nights) I make sure I eat very clean. I’m alone in my hotel room. I will review my presentation. I will make my iterations. I will make sure the design of every slide is as near to perfect as possible. I will look at the content. I will try to make it a little bit better. I will surf the Internet and see what the latest information is on high performance, leadership, personal productivity, and teambuilding. I will review my books and then I will put together the presentation and actually, often repeat the ideas I want to share just to make sure that every line has as much impact as possible. ALEC HOGG: And the presentations: are they similar or do you try to get a fresh presentation every week/month/year/country? ROBIN SHARMA: If I feel excited Alec, then my audience is going to feel excited. Some of the core stories are the same, but I am constantly learning, myself. I will bring what I’m reading, what I’m learning, and my latest conversations with titans of business, or people who are doing amazing things in the world. I will bring all of that into every presentation, so there’s always a new animal even if some of the core ideas might be the same. Even with this event on July 25th in Johannesburg, some of the ideas will be the same, but if the people who were at the previous one come back, they’ll get a new level of learning. I don’t know about you, but I will read a book a number of times and every time I read it, I get a new understanding of the material. It’s not because the book changed. It’s because I’ve grown, so my ability to understand and take in the information is at a new level. All it takes is one insight at an event to completely change your business, your game, or the way you live. ALEC HOGG: Indeed, it does. Robin, as far as books are concerned, I once asked Warren Buffett how many books he reads, because he’s also a bookworm of note who suggests that that’s the way we learn. He said he reads three per day. He must be skimming quite a lot of what he’s seeing. How do you read books? 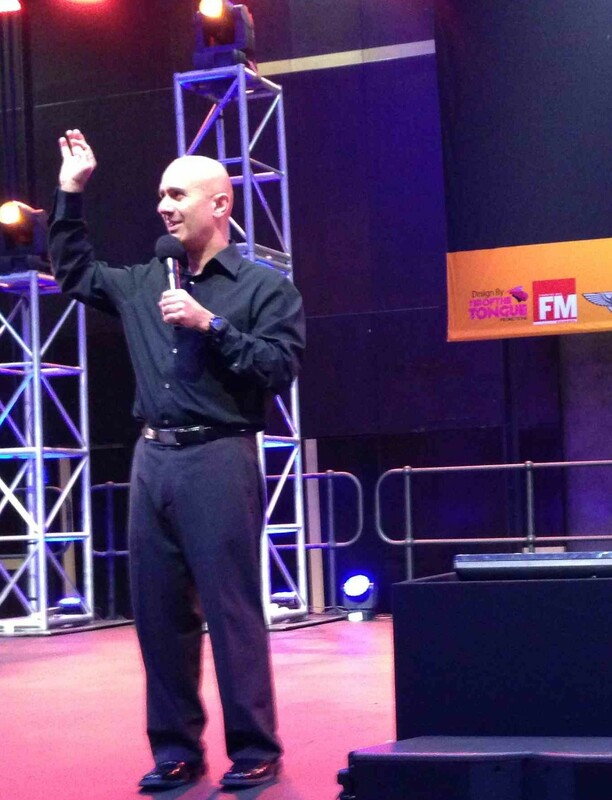 ROBIN SHARMA: I read books by listening to them. I have my Kindle and I love eBooks. I love terrestrial/old-school type of books, but the number one way I consume content is via audio books, off my iPhone and iPod. That way I can use my commute time or if I’m on an airplane, I just listen. While I’m working out at the gym, I’m always listening to audio books and podcasts, and for me, it’s just a great way to learn. ALEC HOGG: Just to close off with, I’ve often wondered about people who are deeply spiritual – as you are – and living in a material world where they’ve been very successful – as you have been, too. How do you balance those two? ROBIN SHARMA: Alec, that’s a brilliant question and I say ‘you just do your best’. Every day is an opportunity. Look, I flew from Zimbabwe to White River, South Africa. I got a chance to sit behind the controls of the little airplane I was on, and every single second as I was holding the controls, I was fighting the wind. Every second, I had to make shifts in the controls to stay on course. That’s how we live life. Sometimes too much in the material world and sometimes we’re going to be too much into philosophy. I’m not a perfect person and every single day is an opportunity to clarify and get closer to my ideals. I think there’s nothing wrong with being in the material world. If you want to have a Ferrari, if you love beautiful wine, (I love your South African wine – like the Pinotage)… If you love that, that’s great. Life is short. Enjoy the pleasures of our material world and at the same time, don’t be so much in the world that you forget to lead without a title, that you forget to develop other human beings, and that you forget to live your values. Don’t be so much in the world that you forget to use your life as an instrument of service, and to do your part to uplift the world in your own unique way.